Wet-aged Vs Dry-Aged Beef: What’s the Difference? Many people ask us at Chicago Steak Company which of the wet-aged beef or the dry-aged beef tastes better when they order steaks. We answer, “yes!” since both our wet-aged steaks and our dry-aged steaks are delicious – it is really a matter of preference. Our consumers can expect the delicious particularities for our aged beef in every selection. Our steaks are hand selected and hand cut by our professional chefs to ensure a quality steak with the right amount of marbling and coloration in each and every steak. Which steak each customer prefers is based on individual taste and other discriminating characteristics. Here is an informative guide to help determine the best steak to suit your personal palate. 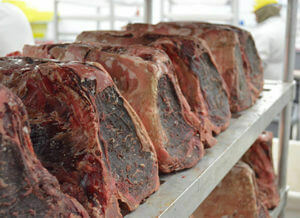 Wet-aged steaks and dry-aged steaks have differing flavors and textures enhanced by the individual aging processes. A dry-aged steak imparts a flavor that is both earthy and nutty, with a sustained piquancy, producing a steak that is both meaty and robust. When browned, the essence has been described as intense and round, with a lavish aroma. Dry-aged beef is characterized by an extraordinarily tender steak because the aging process is lengthier, making the fibers within the muscle more moist and flavorful. This same procedure gives the beef a slightly tart taste, akin to bleu cheese. Wet-aged steaks produce a vibrant “fresh, metallic” flavor, a bonus to steak lovers who prefer their meat newly harvested. Wet-aging steak tastes better in a lean cut of beef like a flat-iron steak, where the steak is less marbled with fat. Beef cut for dry aging starts out much thicker than wet aged beef but will lose considerable mass during the aging process. 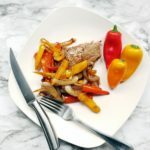 In the end, they both produce an excellent tender and juicy steak. When selecting the steaks in your customized ultimate steak package, it is best to pick a richly marbled steak for a dry-aged purchase, and a fairly lean steak for wet-aged beef. While both processes produce a tantalizing steak, some excellent choices are the Porterhouse, Bone-In Ribeyes, and Bone-In Strip Steaks for a dry-aged steak. 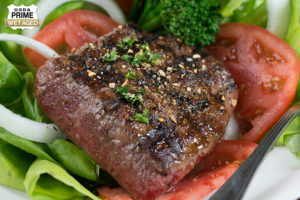 Wet-aged steaks that are very popular selections are the Filet Mignon and the Boneless Strip Steak. 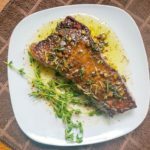 The Wet-aged Flat-Iron steak is continuing to increase in popularity on the Steak connoisseurs’ tables because of its uniformity in size and thickness and the ease of cooking it while grilling. Cooked medium rare, the Flat-Iron Steak is considered by some to be the perfect grilling steak. Here at Chicago Steak Company, we believe our customers deserve the very best quality in steak selection and a wide range of menu choices for their families and guests. We offer a huge selection of both wet-aged beef and dry-aged USDA Prime and Premium steaks to meet each customer’s discerning tastes. 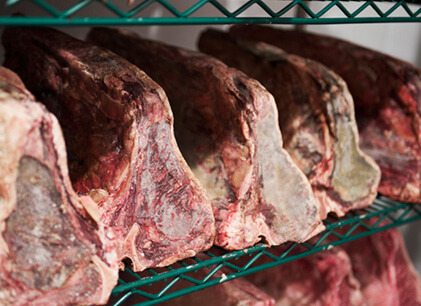 We guarantee customer satisfaction in both service and selection of all of our wet-aged and dry-aged steaks. Don’t take our word for it, try one of every steak to see which exquisite steak is your favorite.